It will come as no surprise that the more I use the iPad the more I like it. It is powerful, gorgeous, and just a lot of fun to use. I do see it replacing a notebook for much of my day-to-day needs. At the same time, however, a few imitations have emerged. Well, to be accurate, a number of limitations that I knew to expect have clearly shown themselves to be limitations that hopefully will change sometime in the near future. First and foremost on that list — the ability to run multiple applications at the same time. Not being able to run more than one application at the same time (beyond those needed applications that Apple, by default, allows to run such as e-mail or music) is an issue on the iPhone, but it is a far bigger issue on the iPad. 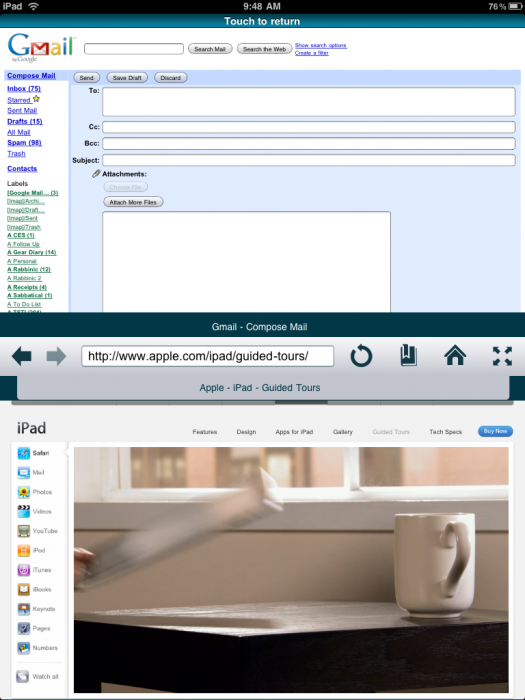 The iPad lends itself to more “work” usage, especially with applications such as pages. But not being able to have other applications running at the same time is a big issue. Is it a deal breaker for me? Not by a longshot. It is, however, a limitation that is already more than a bit annoying. I commented to Larry that the device will only be able to truly take off and do everything I needed to do when it has multitasking. He responded that it needs more than just multitasking — it needs multi-viewing. That is, it needs to offer the ability to see two windows on the same time on the screen. 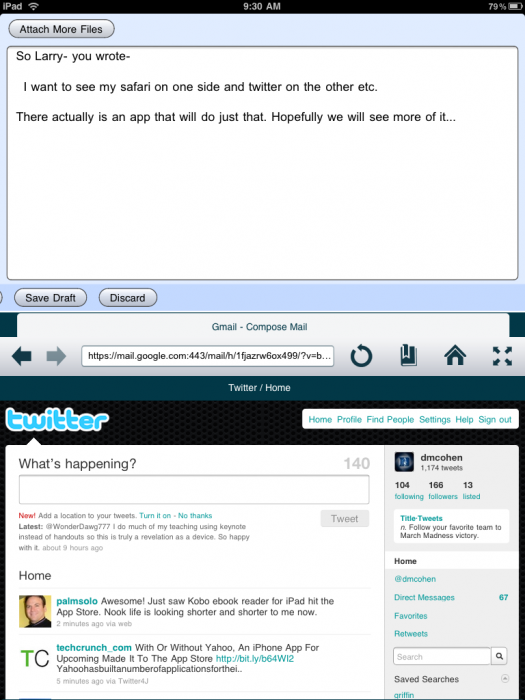 For example — as he put it — I want to be able to look at my twitter feed while also working in Gmail. The more I thought about it the more I realize he’s right. (It is his birthday today, so I have to say that at least three times.) In order to really use the device efficiently it needs to be able to show you two different areas of interest at the same time. And unlike the iPhone, the screen is large enough to allow that to happen. I want to be able to be using twitter but also browse the web and look at what just went up on other websites. 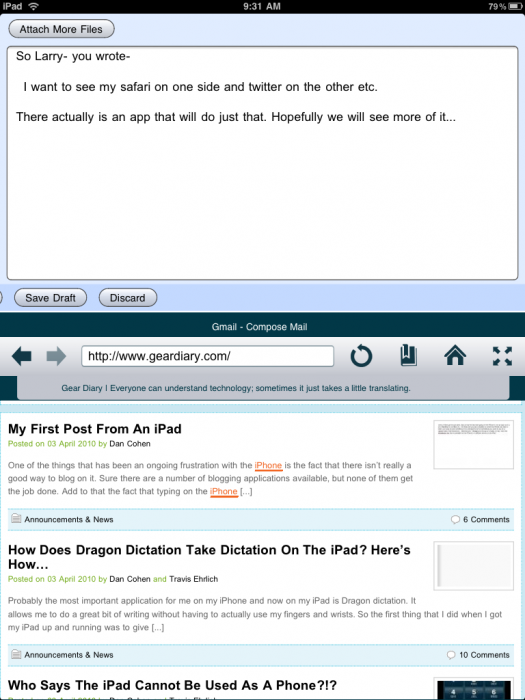 I want to be able to look at the Gear Diary website while also looking at RSS feeds. What is let you do? 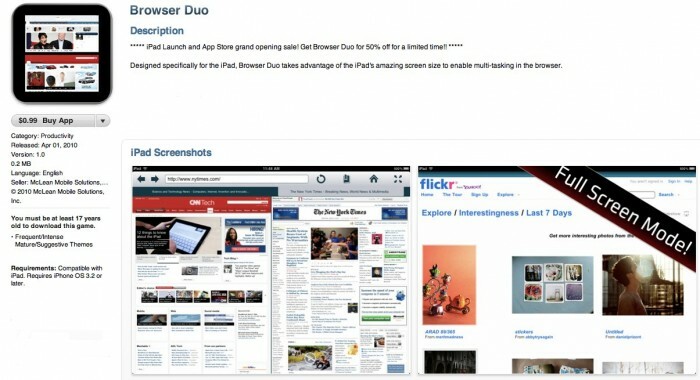 Actually does exactly what the name suggests — it lets you see two different browser windows at the same time. It splits the screen horizontally one holding it in portrait mode so that you get half the screen showing one website and the other half showing another website. 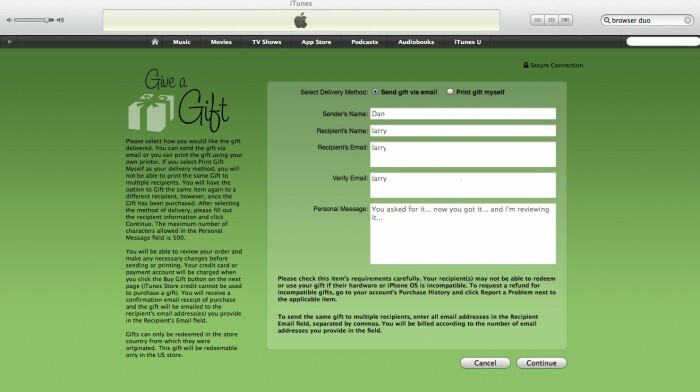 For example — as Larry suggested I went in and put my Twitter feed in one of the windows and my Gmail account any other. That way I was able to actually see and write e-mail while also keeping an eye on what was going on within twitter. If I want to change the bottom screen, I simply tap the screen and then put the new URL into the browser window. The application then loads the next window so that I have my Gmail account and the e-mail that I was writing still in the upper half of the screen, but it was able to load our website in the lower part of the screen. 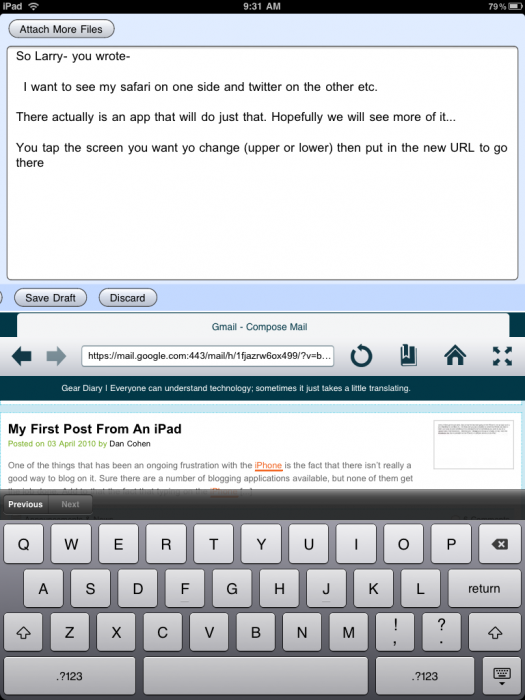 Tapping in the Gmail compose window brought up the keyboard and I was able to type away. You can, of course, set the home page and add favorites and bookmarks. That means the more you use the app the easier it will be to use for quick browsing to your top web sites; but it gets better. You can scroll up and down a page as if you were in a single window browser. And so long as the site does not use Flash… You can even watch video right in the window while, at the same time keeping an eye on email or Twitter in the pane above (or below). Yup, the iPad video demos played flawlessly. The application works quite well, the browser is blazing fast, and I had no hiccups or crashes when I was using it. I like it so much, and it goes fairly far in getting Larry what he wants… That I gifted it to him. You can get it here for $.99. 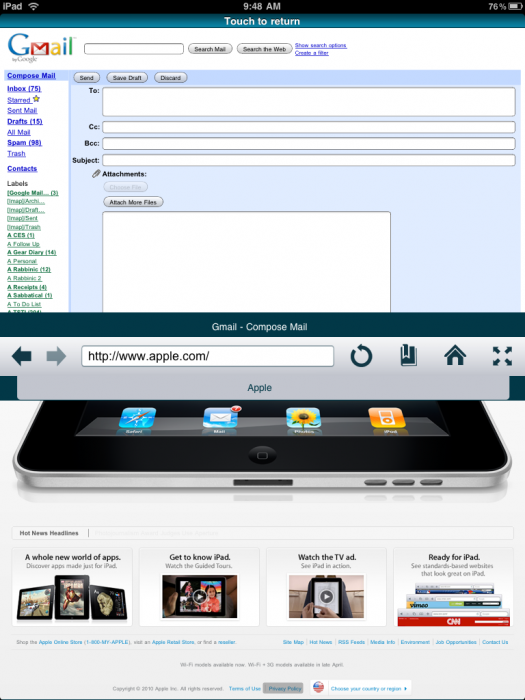 Lets you make real use of the large iPad screen by splitting the screen into two windows. From there you simply browse as normal. It is worth nothing that there is a free app that offers a split screen as well. Unfortunately it requires a bit of side to side scrolling on wide sites and movies don’t seem to play in the browser. It is good for trying out the concept but my recommendation… Spend the $.99.